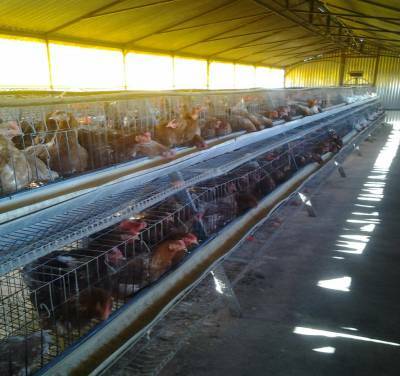 Freeheim Eggs is a chicken layer farm situated at Friemersheim in the Southern Cape region owned by three previously disadvantaged beneficiaries (one woman and two men). The farm is about 1875m² in size and consists of approximately 550 chickens that produce 100 eggs per day. These beneficiaries identified the huge need for egg production on a small scale to sell eggs to the local community shops. They aspire to increase their supply once the demand for eggs is big enough. Research has shown that as a result of the high cost of meat, people are constantly looking for a cheaper source of protein. Eggs provide a valuable yet affordable source of high quality protein and vitamins required for normal growth, especially for children, and the demand for eggs in the cities is very high. The WCDoA’s Livestock Commodity Project Allocation Committee approved funds for this project that were used to procure chicken layers, build a new layer house and install an electrical fence around the building. All these were successfully implemented by Casidra on behalf of the WCDoA. According to Casidra’s Project Manager responsible for implementing the project, Alwin Fuller, this project has demonstrated its potential as a viable farm and will continue to bear fruit in the long run. “I am very impressed about the commitment of the beneficiaries. They enjoy what they do and are passionate about farming. This positive attitude and spirit will take their farming project to greater heights”, says Fuller.